Subscribe to get updated on the most recent information from Bev & Co.- House of Brokers Realty, Inc.
What is more magical and heart-warming than the glow of holiday lights? The season is upon us, and we've compiled our annual list of some of the most festive displays and seasonal attractions around Columbia and the surrounding areas! A Columbia landmark! The Village of Cherry Hill is home to this tree adorned with colorful lights from trunk to treetop. Bring your camera- this is the perfect spot for a family photo! Open daily, evenings until January 6th. For the second year, the Candy Cane Crib finds it's home at Logboat Brewing Company! Head downtown to check out an impressive light display and support a good cause. The Candy Cane Crib proudly takes donations for the local Boys & Girls Club of Columbia. Plan to visit the big man himself at Santa Night on Saturday, December 15th from 6-9pm! Enjoy photo opportunities, food trucks, craft beer, and of course Christmas lights! Home to the world-famous Budweiser Clydesdales, Warm Springs Ranch in Boonville is decorated with thousands of holiday lights! This year, the light display is bigger and better than last year's, including miles of lighted garlands, a giant all-red wreath adorning the main barn, and a magnificent semi-truck complete with a full light show! Horse lovers can stroll through the stables and take a photo with a Clydesdale. Guests 21 & up receive two complimentary Budweisers, or you may purchase hot chocolate, cider, kettle corn, potato chips or roasted almonds. Thursday-Sunday from 5-9pm, through December 30th. $10 admission, reservations required. Book online here! 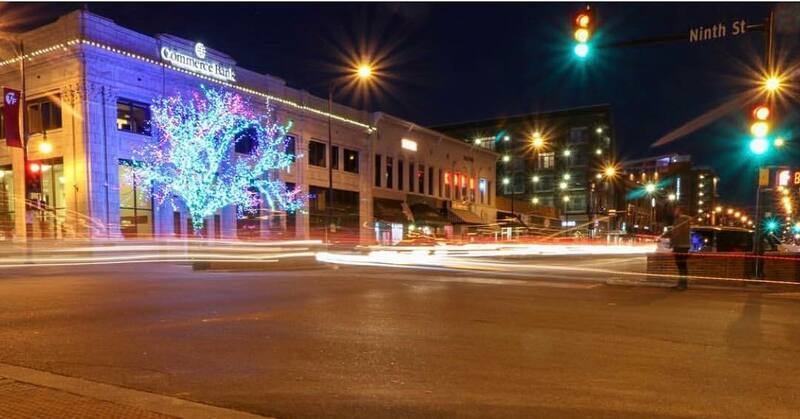 Downtown Columbia's own "magic tree" lights up the corner of 9th St and Broadway in front of Commerce Bank. Giant illuminated snowflakes line Broadway and an enormous wreath hangs on Landmark Bank! Support our local businesses and visit some of the eclectic and unique downtown shops for those last-minute gifts! The largest magic tree in Columbia! This 85-foot Sycamore tree is adorned with over 200,000 lights, totaling 38 miles! The Crossing began their tree to remind us all of what the holiday season is truly about- precious time spent together with loved ones. Each of the twinkling lights represents nearly everyone living in Boone County. Open 5-10 pm daily. Enjoy hot drinks and live music on Friday evenings from 6-9pm. Thecrossingmagictree.com. Located in Fulton's Veteran's Park, the Festival of Lights is becoming quite the mid-Missouri attraction! Leave a message of hope to others at The Wish Tree, wrapped with over 10,000 lights. Take a stroll down "lover's lane", a lighted bridge inspired by the real Lover's Lane in Paris. Admire 66 decorated trees in the Field of Joy, donated by local businesses, organizations, churches, and families- and make sure to look for the tree from our favorite organization, the Super Sam Foundation! Check it out from dusk to dawn until New Year's Day. Do you have a favorite light display that didn't make it on the list?